Before I started Just Keep Sweating, and if we're being honest, before I really started focusing on my healthier lifestyle I used another website to blog on. I went on this site the other day and looked through my "fat photos" or what I could find. I was so good at hiding pictures of my heavier self that now I wish I didn't do that so I can see how far I have truly come. Anyways I also read through my old blog posts and most of them made me sad. I was SO sad and I didn't even know at the time. However, there are a few happier posts and I wanted to share one with you today. 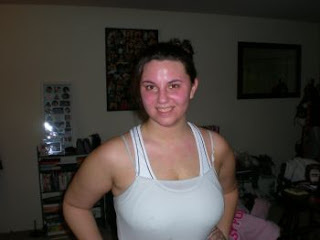 This post was from the first day of the Couch to 5k program, the first day I really ran. Around 7:45 I decided I am going to powerwalk this morning outside and with the babies that way we all get cardio and enjoy the beautiful weather( it REALLY is motivating) we all got dressed, me in my yoga pants sports bra and suffolk sweatshirt and them in their harnesses and started our 30 minute excursion. Normally we just walk the entire time but I decided why not walk on the grassy spots and jog through the parking lots? And that we did for little bursts of jogging... they loved it and i loved it. After 30 min I decided to drop them off, drink some water and push myself to FINALLY start the COUCH TO 5K program... I have been putting this off with endless excuses for about a month, and i decided there is no time like the present, grabbed my ipod touch(which has the couch to 5k app) and left. When I started it was really easy I was like 60 seconds jogging is nothing, i didn't get tired until halfway through... I was about to quit because I didn't want to walk/jog anymore because it was getting harder... then the app said "halfway point," i knew i couldn't quit now I made it halfway through and it was only my first day, I quit things too easily all the time and this is something I want to really do so why short myself? ...I pushed through, i felt the breeze on my face, the fresh air in my lungs and pavement beneath my sneakers. I was running and I was going to complete my first day. It was such a great feeling. After I was done I was on a high, my boyfriend who FOR ONCE woke up early couldn't believe how much I accomplished before 9 am. He even went to workout himself because I MOTIVATED HIM! Yay, good for you!! I know that feeling of looking down at your distance or time and feeling like you want to stop but pushing yourself to keep going! And finally, when you're finished, you feel SO good, right? Love that. Good for you! We all started in the same place! Way to keep on keepin' ok! I started with the C25K too in 2009 it was the best decision I ever made. Stick with it!